Ahh, Connecticut. All is forgiven. Spring is finally here and it’s just glorious. Speaking of glorious – the new Spring menus have officially launched at all Max locations, and from April 7 – 13th, you can sample them during Max’s own Restaurant Week: with menus ranging in price from $10 – $29. 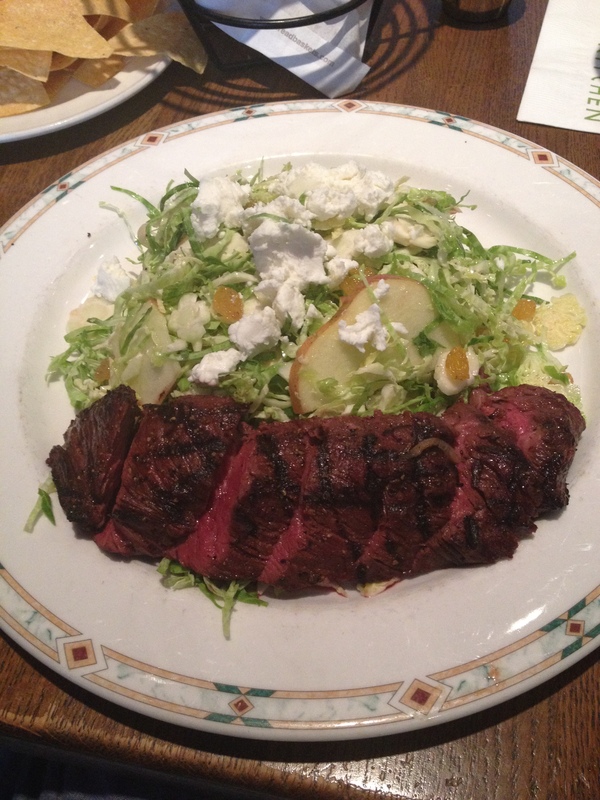 Here’s my most recent foray into Max dining at Trumbull Kitchen – a combination of the flank steak entrée with a side of shaved raw brussel sprouts, goat cheese, and apple for a very healthy and seasonal salad! Not listed in the above fantasizing but equally noteworthy are the awesome deals at the Max Burgers in West Hartford and Longmeadow, respectively. Max Burger West Hartford is offering a $5.00 5 oz burger and $5.00 draft beer combo, and Max Burger Longmeadow has a “Sammys & Sliders” combo of 3 sliders with a Sam Adams or Boston Beer Company draft. Get your fix from prixe fixe this week people – there are plenty of options to choose from. Mangia, mangia, mangia! Previous Previous post: #TGIF Mixology lesson for a good cause with Time Out Sports Bar! Next Next post: Meet Penelope!